this province also live the Javanese and the Balinese, who originally came as transmigrants. Lake Poso and Lake Lindu are located in this province. The Lore Lindu National Park which covers 2,300 square kilometers lies in the southeast of Palu. 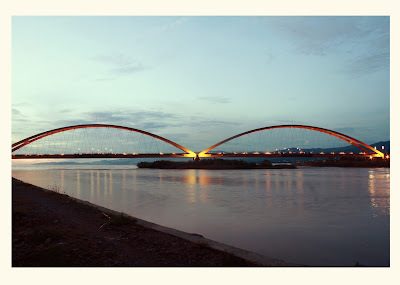 Other interesting places in this province are the historical site of the settlements of travelers from the Neolithic age along the Karama River. The area wide of Central Sulawesi Province is 68033 Km2. Administratively, Central Sulawesi Province divided into eight regencies and one town with 85 Districts dan1432 village with number of residents' 2.215.449 men and density of average level is 29 men/Km2.While the resident growth rate equal to 2,59%.While the resident of Central Sulawesi Province who resided in settlement area of hinterland is 30% coastal area is 60% and archipelago area is 10%. Central Sulawesi's historical background remains partly undisclosed, despite the research that has been done since the early decades of this century. Among others by the European scholars Albert C. Kruyt, in 1909, and Kaudern in 1917-1920.Studies were made, for instance, in the Poso regency, around the districts of North and South Lore and North and South Pamona.In the Donggala regency, similar work was under taken in the Kuwali district, particularly around Biromaru and Dolo. Up to this moment,86 kalamba ( dialects of Bada-Poso ) have been recorded. Found also were some big and round stone vessels, believed to be containers for bones. Further to the north, many ornament in the shape of animals were found. The regency of Poso seems to be rich in relics of the megalith era. For example, in Tentena village, east of Lake Poso, several caves were found containing bones and imprints of the palm of human hands. A number of menhirs were also found. Similar finds were made in Kolonedale. Covered stone jars were found in Lore and Koro. Fifty-eight pounding stones were found in the Palu Valley of Donggala,in Napu, Bada and Besoa, around Poso. Not less than 26 vatutau, or stone statues, were found in Kili Pamona, Poso regency. Found were also grinding stones, stone blocks with small holes, and small pounding blocks. Found in the surroundings of Pamona were nine pieces of bronze axes, in the Palu district. According to estimates, such prehistoric sites could have existed since 55 years before the Christian era. Almost all the megalithic items of Central Sulawesi were scattered across the highlands of Bada, Napu and Besoa. These areas are inhabited by the Lore people, who live along the Lariang river, the longest river in Sulawesi. Other finds dated from around the time of the arrival of Islam, such as a temple like structure called a Lobo. Also dwellings called tambi and duhanga. Islam entered Central Sulawesi through Donggala and Palu, approximately around the beginning of the 15th century, first, from Makasar, in 1403 then from Ternate, in about 1470. Islam was brought from the Minangkabau to the Kaili Valley by Dato Karam, who came by boat. The first to be converted to Islam was King Kaboneka I Pue Nyidi. In obeisance to the teachings of Islam, he exchanged his loincloth for a sarong when praying. The Arabs are presumed to be the ones who introduced Islam to this area. However, written evidence is lacking. The rich cultural legacy of the people of Central Sulawesi and their continued adherence to the ancestral traditions, make Central Sullies one of the most interesting provinces in the region. The capital of the Donggala regency is Palu, which is the capital of the Province of Central Sulawesi. The town is located on Palu Bay whereas Donggala it self lies at the tip of Tangoing Charring, about 26 kilometers towards the northwest. Traveling from Palu towards the south, one sees in front of him the outlines of the Takolekaju mountain range stretching towards South Sulawesi. One of the highest is Mount Waukara (2,127 meters). two kilometers from Palu's center. The grave of Dato Karama is in the Lere area, two kilometers from Palu. It is the grave of an Islamic leader, who was the first person to teach Islam in Palu.His full name was Abdullah-Raqie Dato Karama. The Tolare Tribe, is a group of people living in the Donggala regency and Palu Valley. These people are today more advanced than the Towana tribe people who live in the hinterland of Central Sulawesi, having had contact people from other areas. The Souraja Museum is located in Kaili. This Museum is a former king's palace and contains the royal heir looms.Souraja are the big houses of the nobility. Such houses were usually built on the beach and were inhabited by descendants of Bugis nobility from South Sulawesi. The Bugis people, being sailors and merchants, settled along the beaches and their descendants followed their examples. The houses are built on platforms. Their pillars are made of ulin iron wood. The front and back parts are covered with beautiful painted wooden board. In front of the stairs, a water pot is always put to wash the feet before entering the houses. Lonta Karafana,is the front room of a souraja house. This is where guests are received. Lonta Tatangana is the middle room, the back room is called Lonta Larana. These spaces are separated by walls and are used as sleeping quarters for the family. The women are given the back room. A Tambi house, is a typical mountain dwelling and belongs to the to Bada people, living in South Lore. Its roof is made of dopi, split bamboo. Palu fiber or thatch are put on top of it. A Tambi house must face the sun. The stairs must be short. The granary is called Gampiri or Buho . Talise Beach is located near Palu. Some recreational activities for sports are available. Tirta Bahari Beach, is mainly for children. During the holidays, this beach is crowded with children. Several facilities are available here. It is located in Bumi Bahari, about two kilometers from Palu. Bulu Masomba is a camping site managed by the government. It is an ideal place for youth recreation. 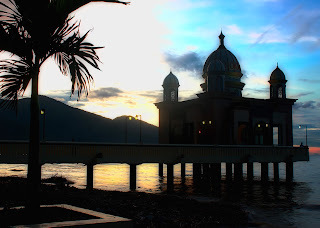 It is located on the beach in Kavatuna, six kilometers from Palu on the bay. A pleasant recreation beach is found here. Porame,which in only seven kilometers from Palu,is another camping ground but located in the hills. In the vicinity is an irrigation dam and a swimming pool. Accommodation facilities and a few restaurants are available. Masomba, in Tondo, about 10 kilometers from Palu, has a traditional horse-racing circuit on a hill. Ideal for camping and recreation. Mamboro Beach is ideal for swimming, boating and fishing. Plywood and rattan processing mills are found in this area. About 12 kilometers from Palu. Paneki is a camping ground owned by the government. it covers an area of about four hectares and can accommodate 2,500 people. Communication facilities are available. This area is often used for scout jamborees. Paneki is also good for recreation on the Paneki river. It is only 15 kilometers from Palu and can be reached easily. Loli Indah Park, beautiful park managed by a private company. It has a waterfall and a swimming pool fed by a mountain spring. It is located at Loli village, about 17 kilometers from Palu. The Patunonju Archaeological Park 19 kilometers from Palu, contains megalith stones shaped like a pounding blocks. This site often used as camping site. Vera Recreation Park lies 22 kilometers from Palu, It is also a camping area, 250 hectares large. There is a 75-meter-high waterfall at the site. Rainfall is rather high, but suitable for nature lovers and mountaineers. Bora Village, is an old village in the district of Sigi-Biro maru, Donggala regency. The people still adhere strongly to their inherited ancestral costumes and traditions. The raego dance is a popular traditional dance from this village. There is also a hot-water pool and a camping ground. We can also admire the scenery of the valley and Palu Bay in the distance. Bora is about 23 kilometers from Palu. Tanjung Karang Beach, is a recreation beach 46 kilometers from Palu. The distance prom Tanjung Karang to Donggala is 12 kilometers. Lembasada, is a camping site amidst beautiful natural surroundings. The site can accommodate up to 1,500 people. From Donggala, the distance is about 21 kilometers. Mantikole, is a local resort with a hot-water pool. Nearby are a number of megaliths, such as stone altars and the stone pillars of a prehistoric Baruga. a Baruga is a hall of Kaili tribes people, used for consultations. It is located 25 kilometers from Palu. The recreation forest of Lake Lindu covers an area of 31,000 hectares. Various species of flora and fauna are found here. There is a natural lake 100 meters deep. In the middle of the lake is an island called Bola Island. On this island is the grave of Maradindo, whose gravestone measures 1.5 by 2.5 meters and bears the figure of a buffalo's head. Every year, the local people hold a religious service at the spot. The site is located 82 kilometers from Palu or 24 kilometers from Kulawi. Part of the trip must be made on horse-back. This Island is about 190 kilometers to the north of Palu city, or 100 kilometers from Toli-toli. The famous village is Pangalasiang in Dampelassojol District of Donggala Regency. According to local tradition, this island was once a camp for brave sailors coming from as far as Mindanao in the Philippines. They came to trade and sailed across the ocean until they reached Indonesia.However,being used to war, they first attacked the local people, the Pandau then killed each other. That is perhaps the reason why this island is called " Pangalasiang " a place where souls are taken. Pangalaseang Strait, is the narrow strait that separated the island from tanjung Pengalaseang, on the mainland. This strait was formerly a haven for ships and boats sailing from Donggala to Toli-toli. 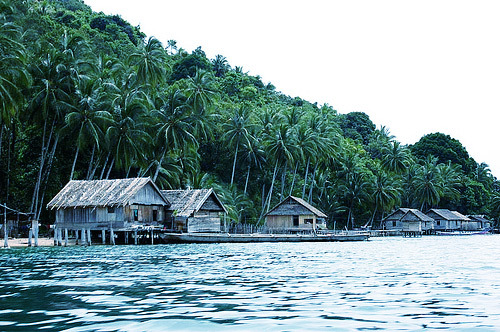 Pangalaseang Island has a population of about 2,500,consisting of Bugis, Mandar, Dampelas, Kaili and Pandau people. This is a fertile island on which almost anything grows. Widely known are its cloves. The main product of the island, however is coconuts, Rice is imported from Donggala. The regency of Poso has its capital in Poso, a pleasant town on Poso Bay. 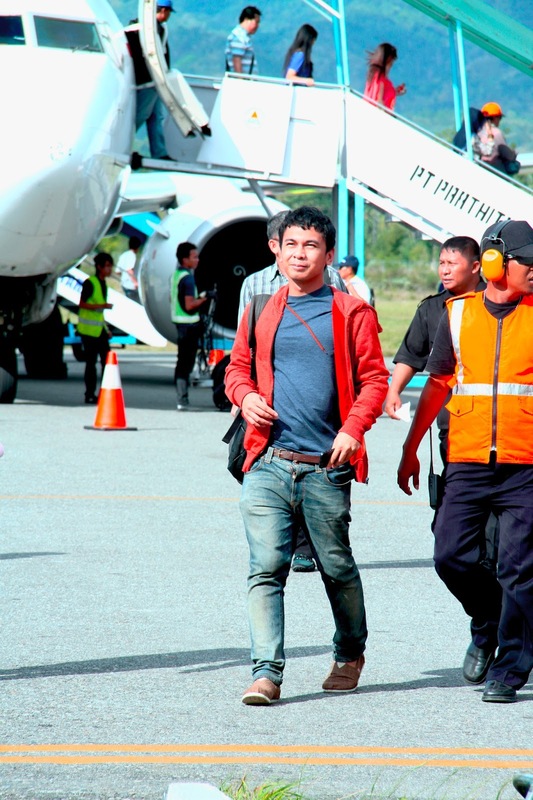 Poso also has a seaport and an airport. In the Southern part of the regency are the mountain Tineba and Lake Poso. The highest and best know mountain are, Porekautimbu ( 2,509 m ), Bukitilu ( 2,244 m ) nearby Poso Lake and Tokala ( 2,630 m ). Wuasa, Gintu, Pindolo, Tomala, tentena, Kolonodale, Bungku, Kaleroang and Uekuli. Some of the most important towns are Wuasa, Gintu, Pindolo, Tomala, Tentena, Kolonodale, Bungku, Kaleroang, ( on Salabangka Island ), and Uekuli. Tanjung Poso is a beach resort with beautiful scenery. The sea is shallow and calm. Good for swimming, bathing and boating or fishing. 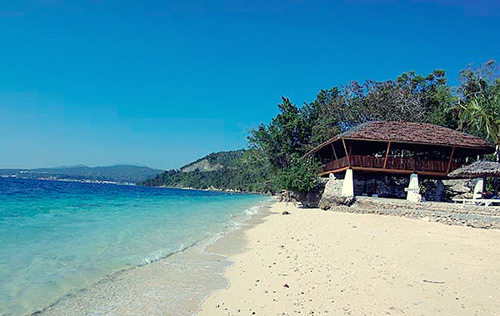 The beach is located in the surroundings of Poso and is easy to reach over land. 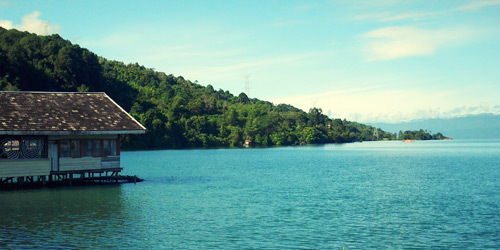 The Poso recreation beach is suitable for water sports. It is located near the town Poso. Tentena is 56 kilometers from Poso. It is a small town in which the majority of the people are Christians. In this small peaceful town one can still find old Dutch-built bungalows high in the mountains, facing the lake. 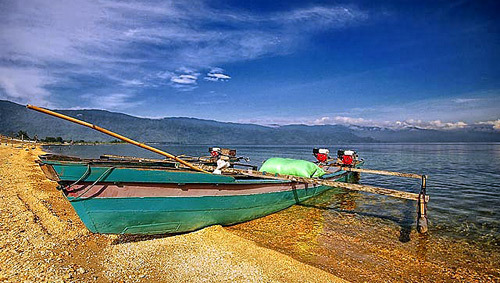 Lake Poso is the biggest and most enchanting lake in Central Sulawesi. The lake occupies an area of about 32,320 hectares, 500 meters above sea level. Various kinds of fish are found in the lake, such as sidar (masapi), ale and selegi. Near the lake is Pamona Cave, in which the fossilized bones an ancient human being and stone gong were found. Not far to the east of Tentena is the small hill, where King Pamona lies buried. Tapak Tangan Cave near Ganda village is of historic interest. It can reached by motorboat within 30 minutes from the seaport of Kolonodale.Found here on the wall outside the cave was big imprint of the palm of a human land. The Tanjung Api Nature reserve 15 miles from Ampana town, about 156 kilometers from Poso.A flame bursts out of a fissure in the earth. There is also a wildlife reserve in this area, not far from the shore. Jompi Waterfall is a waterfall on a beach. The beach and forest scenery are most alluring. Batu Payung,234 kilometers from Poso is a rocky island that looks like a half-opened umbrella. The views here are beautiful. Batu Payung is regarded by the local people as holy. All boats or ships intending to enter the harbor of Kolonodale are expected to sound their horns to ensure safety of passage. Marowali is a nature and wildlife reserve for the protection of the area's tropical lowland flora and fauna, especially the agathis species. Animal species living here are the anoa, maleo, pig-deer and many others. 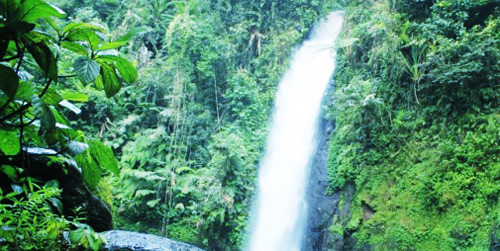 The Lore Lindu National Park is the western side of the Poso regency. The presence of Mount Nokilalaki (2,355m) and Lake Lindu,are 31,000-square-meters body of water, enhances the charm of this important reserve. Megaliths are found in abundance in and around nearby Napu. There is also camping ground in the valley of Sopu and Marena,located in a beautiful setting. Across the valley flows the clear, cool Laroang river. Grasslands extend up to the horizon. Deer live in this environment. Visitors can go hunting on horse-back in the traditional manner of the area. Kolonodale is the capital of the Petasia district. 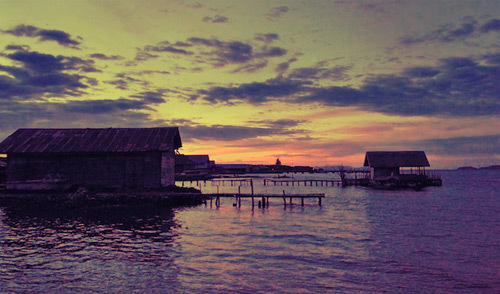 It is a small historical town and one of the oldest harbors in the Poso regency. For centuries, the port has been visited by boats coming from various other regions of Sulawesi.The distance is 234 kilometers from Poso.In Kolonodale is a cave in which bones and the imprint of the palm of a hand were found. Boats, typical of the area, line the coast. Megalithic sites can be found in Lore and Koro, Poso regency. In Napu, Bada and Besoa are found covered stone coffins, or Kalamba. Also stone, slabs or vatunonju . Stone statues or vatutau were found in the surroundings of Tentena and Peana. Other interesting megaliths can be seen around Gintu-Bekakaku, west of Lake Poso. This regency consists of tiny islands, stretching in front of Tomohon Bay. 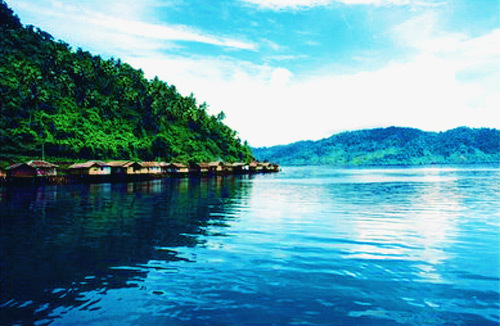 Luwuk is the name of the regency's capital, which lies on the eastern coast of Central Sulawesi. The weather is hot. Here and there the land is dry and barren. However, the town Luwuk looks clean and pleasant. There is an airport near the beach, named Bubung at a distance of 12 kilometers from the center of the town. Twin Otters maintain the link with Ujungpandang, Palu and Manado. Sites of interest include Kilo Lima Beach, a pleasant seaside recreation area for water sports. It is about 2 kilometers from Luwuk. Kayoan - Bubung Beach,10 kilometers from Luwuk, a nice shallow beach. You can go boating, swimming or fishing. Kayoan is a popular camping ground,3 hectares large. Clean water and firewood is available. Its distance about 15 kilometers from Luwuk. Solidik - Mendono, a mountain resort full of attractions. There is a small lake with clear water. It is 26 kilometers from Luwuk. About one kilometer away lies the village of Solidik, which is another comfortable resort in the mountains. Young people especially seem to like them. Bankiriang, a nature reserve 3,500 hectares large. Here live in freedom rare animals like the protected maleo birds. There is also a cattle breeding farm. It can easily be reached from Luwuk. The distance is 15 kilometers. About two kilometers further is Batui, the capital of the district. Pagimana is a Bajo settlement,65 kilometers from Luwuk. The environment around it is rich in unspoiled scenery. The hills, however, are arid and barren, and yellowish brown in colors. There is a fish market and a meeting place for the Bajo people. Peleng Island lies to the south of Luwuk Beach. You can visit this island by taking a motorboat or boat and in two hours arrive at the town Tataba. The five district capitals on the island are Tataba, Bulagi, Liang, Salakan and Sambiut. There are three fine bays: Bangkalan (Bangkalan Island ) in the north and Peleng and Masamat in the south. The 1,059-meter-high Mount Tombila rises proudly in the distance. Most people on this island make their living planting coconuts and sweet potatoes or fishing. At the end of a steep, twisting path is Liang Cave, located in Liang distric. Stalagmites and stalactites decorate the cave's floor and ceiling. The cave was probably a place of worship for the local people until Islam made its entry in to this area. There are quite a number Islands in the Surroundings of Peleng Island. They are:Bengkulu, Labobo,Banggai, Kebongan, Kotudan, Tropettenando, Timpau, Salue Besar, Salue Kecil, Masepe and Bowokan. Banggai Island can be reached by motorboat from Liang. The trip itself is exciting and it takes only two hours. From Banggai we can pay a visit to a pearl oyster breeding farm owned by a Javanese company. Such oysters are found in abundance surrounding the islands of Island Tropot, Bokan and Bangkurung. Banggai town itself is a legacy of the old kingdom. The former royal palace it still well maintained. It is very easy to reach this beautiful Island. Sea transportation in the area is smooth. Available are big ships, sailboats and motorboats. In the northern part of the Luwuk Banggai regency is the Bay of Tomini. In the bay is a group of islands, comprising the islands Batudaka, Togian Unauna, Waleakodi, Talatakoh, Masoni and Poat. On Poat Island live plenty of Canarium Crabs, which are bigger than ordinary crabs and have a harder shell. They are black and usually live under trees. Canarium crabs can climb coconut trees. Una-una Island belongs to the island group of Togian in Tomini Bay. There are eight village on the island, whose inhabitants number 7,000.Formerly, Una-una was known in eastern Indonesia for its rich coconut plantations. Dark clouds cover the sky above the active volcano Colo. Mount Colo last erupted on July 23,1983. Rumblings are still frequently heard from the crater. Copra was in the past the island's main source of income. That source was wiped out in 1983 when Mount Colo, during its last eruption, destroyed most of the island's coconut trees. The Regency of Buol Toli-toli has a capital named Toli-toli, a small town in the northern part of central Sulawesi. Toli-toli is a beach city lying in front of Toli-toli Bay. Available here are an airport and a seaport. Lutungan Island lies in the north of Toli-toli. Found here is the grave of king Toli-toli which deemed sacred by the local people. This is a maritime recreational island in pleasant atmosphere. The environment and the white sandy beach are really amazing. The island lies one mile from Toli-toli, reachable by motorboat. Sematang Island is about 25 miles from Toli-toli,in the middle of a calm sea. Its fine beach is suitable for recreation. Santigi Island is suitable for water sports. Traditional sailboats can be hired. The beach lies 59 kilometers away from Toli-toli. Another equally attractive place is Salumpaga. here are the remnants of an old Dutch fort. From Toli-toli it distance 67 kilometers. Bale Masigi looks like a mosque, but is actually the former royal palace of Toli-toli. The building was constructed in 1800 and can be found in Nalu, about two kilometers from Toli-toli. Dadakitan is a camping ground six hectares large, with a capacity to accommodate about 3,000.The distance from Toli-toli is 15 kilometers. The scenery in the surroundings is very beautiful. Clear water and firewood are no problem. Find special offers to many domestic and international destinations. Bring your family to have a good time together in the year's best time to go on vacation. 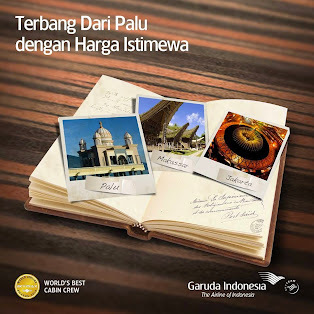 Fly comfortably above the rest with Garuda Indonesia.